Goodness, where to start with my spiritual goals? I'm super satisfied with where I'm at. 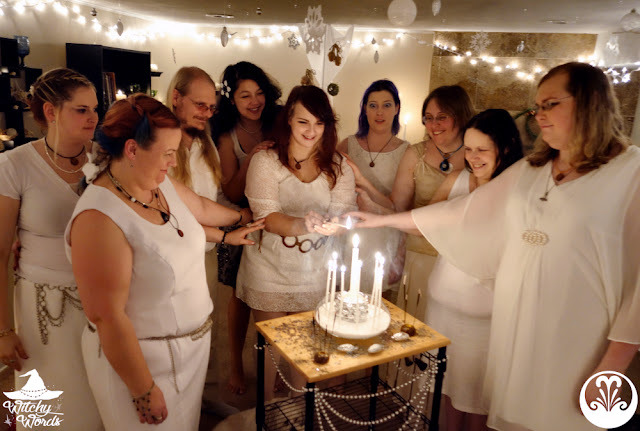 I'm active in the KC pagan community, I volunteer as a photographer for a variety of public rituals and covens, I'm a the author of Witchy Words and I'm the Circle Coordinator of my amazing chosen family, Circle of Fountains. Our membership numbers grew from just three when we started in Ostara 2014 to now eight Primary Members, three Guest Members and three Associate Members (significant others of Primary Members)! We just started our Noviceship program with our three new Novices, we've extended our coursework in the circle to include four advanced courses and we've added a ritual component to our esbats that you'll get to see. We'll be performing the public Midsummer ritual this year, along with teaching a class on Witch Bottles and Jars with KCWMU and another class on Hermetic spellcraft with Heartland Spiritual Alliance's Spirit Circle in December. Pretty darn stoked are we. So, all-in-all, this is the area of my life that I feel needs the least amount of work aside from my relationship and knowledge goals. It doesn't mean that there's nothing I could do to improve it, though! Last year, I was so happy with this area that I left only one block for goals. This year, I'm leaving two because I didn't complete my goal from last year. I think it's pretty obvious as to what I want to do with this section so let's flesh it out. Last year, I worked on Witchy Words quite a bit. I change the layout, developed pages and made navigation a bit easier around here. The one thing I didn't get around to was some sort of posting schedule. I have to admit something: I sometimes feel downright awful about the frequency I post and the content I produce for you guys. I can't tell you how much it blows my mind that I have such a following, because I frankly post so sporadically and mostly about my personal life. While I know a lot of you have told me that you love to hear about my personal life, I'm sure that's not what drew you to Witchy Words in the first place. This is an issue with Witchy Words that I've identified for quite some time. Every year, I try to implement a posting schedule and fail. 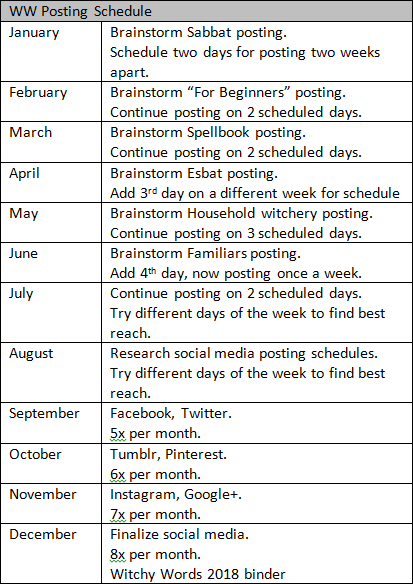 In 2015, I wanted to take a month to brainstorm posting schedules in July, plan them out in August and implement the schedule by October. July is when we were told we were moving. I never got a chance to get that far. Then, I tried again in 2016, but the basement flooded and we bought a house. I'm hoping that having stability in the home this year will give a chance to tackle my posting schedule a bit more. And, while the frequency is a concern of mine, so is the content. If I start following a frequent posting schedule, I don't want to stretch for content or produce utter rubbish for you. That's never been the point of this blog. So, with posting more often comes posting quality content about the things you guys come here for the most. I know you many of you probably came here for the sabbats. Those are my favorite posts and I'm certainly never going to stop doing them. I did miss some Liithi Lushede posts from the hectic craze of the move but I'm going to get back to doing those this year. Also, I know I've missed every altar post since Mabon. Honestly, I'm struggling to find a good place for my altar right now, so I've got to come up with something if I want to continue those. I also see that my For Beginners and esbats sections are rather empty. I will be initiating esbats with my circle that will focus on teaching the two new Novices. One of the Novices is not yet out of the "broom closet," so we won't be taking larger pictures of them. However, I'm sure I can come up with something there to post here. I also have a relatively small spellbook area, and I wish household focused more on household witchery than "look at how I decorated, wee!" Definitely some improvements that could happen there. And, finally, I started a familiars series that I need to complete this year. Of course, if you have anything specific from those sections that you'd like to see, let me know! I always want to know what my readers are interested and what they're thinking. If I can help, that makes my day! 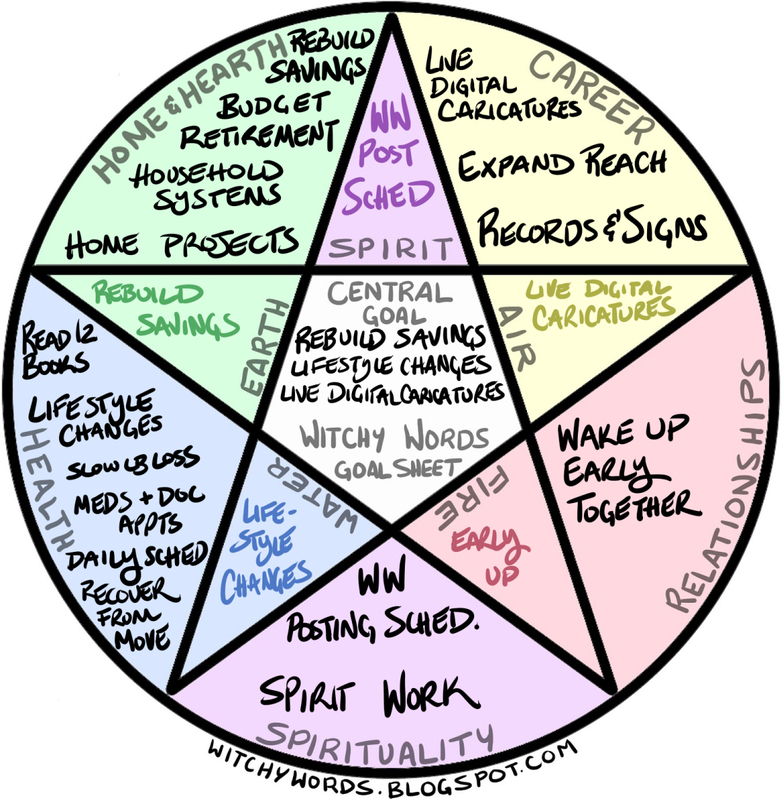 I've also talked to my circle and each Primary Member has offered to do a guest post for Witchy Words. The best part about Circle of Fountains is that we're extremely diverse. No two of us have the same spiritual or life path. We're all doing all sorts of different things. So where I'm nontheistic, I have a circlemate willing to write on deity. Where I don't have children, one's offered to talk about raising children in the craft. So on and so forth. It's pretty amazing. Keep in mind that, while this schedule starts off at just two posts a month, those are two scheduled posts. If I have more relative content - say, our circle's Imbolc ritual, Heena Lushede's Imbolc ritual and my personal Imbolc altar - it will all get posted during the appropriate time frame. I just want to have a confirmed certain schedule to start with. If I post extra around that, then that works too! I've been convinced for some time now that my cottage witchery is heading towards headwitchery. While I consider myself fairly adept in spiritwork, a lot of it comes from experience and less from reference. This year, I have a slew of books I want to read and things I want to do revolving around learning spiritwork. 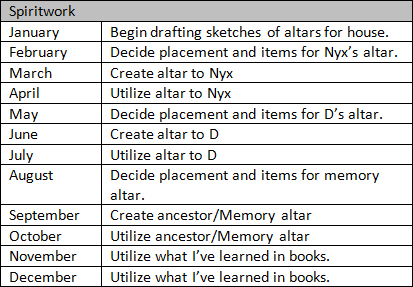 A lot of this involves building altars to specific spirits I work with. In conjunction, I'll be using my Knowledge Goals reading list to improve on my skill set. Spiritual Goals - 0% Complete for the month. My Big Three and My Tracking System! What are your spiritual goals for 2017? I can't wait to see how this blog will evolve in 2017! !